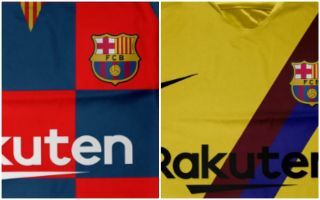 A photo showing two Barcelona kits looking a lot like the leaked designs that have come out in recent times appear to confirm the club’s kits for the 2019-20 season. FootyHeadlines reported on the yellow away kit yesterday, and La Liga journalist Benjamin Crump has seemingly got hold of the real strips. See the pictures below for the controversial new Barca home shirt, which moves away from traditional stripes to a chequered design. The away kit, meanwhile, looks very nice and is a nod to some classic old away shirts worn by the Catalan giants.